For 50 years, Stamporama member Richard Novick has been asking famous people to sign stamps which picture them or are otherwise related to their claim to fame. The story of Richard's unique collection was first featured in the November, 2003 issue of The American Philatelist, journal of the American Philatelic Society. In the spring of 1950, I attended a stamp club meeting of the Brooklyn Junior Philatelists where the guest speaker was Ernest Kehr. He had a souvenir sheet from Guatemala (Scott C92) that pictured President Franklin D. Roosevelt. Across the sheet was the President's signature. I thought to myself that this would be an interesting thing to collect, and so my search for autographs on stamps began. General Douglas MacArthur was in the news quite a bit at the time, and as he was pictured on a set of stamps from the Philippines (Scott 519-521), I decided to start my collection by writing to him. I pasted Scott 520, which is the lightest in color of the set, right in the center of a 3x5-inch white card, and requested in my letter that the General sign his name directly across the stamp, thus tying it to the card. It so happened that I had built up a collection of MacArthur material, so I decided to photograph it and send the pictures along with my request. I sent my letter off on April 30, 1950, to General MacArthur's headquarters in Japan. On May 25, I had the General's autograph just as I had requested it, signed right across the stamp. Having succeeded in my first attempt, I next wrote to King Carol II of Romania, enclosing a card with Romania Scott 447. I noted in my request that a recent article in Linn's Stamp News stated that he did not like writing across the face of a stamp, and I requested that he make an exception in this case. I addressed my letter to his villa in Portugal, and a month later, back came his autograph across the stamp. 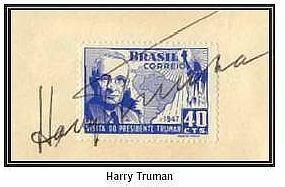 To obtain President Harry Truman's autograph on a stamp from Brazil (Scott 673), I had to write two letters. The first I wrote while he was still in office in 1952. Instead of writing directly to him, I tried to obtain the signature by writing to his daughter. I received a letter from her secretary stating that, due to the pressure of official business, the President could not take the time to autograph the numerous items sent to him. The second letter I wrote after he was out of office. I sent this request to his home in Independence, Missouri, and a few days later I had his autograph. Mrs. Franklin D. Roosevelt graciously autographed a stamp from El Salvador (Scott 607), after I wrote to her at her home in Hyde Park, New York. Admiral Richard E. Byrd was not pictured on a stamp, so I used a stamp that pertained to him. This was the 1933 Byrd Antarctic Issue (U.S. Scott733). After writing to him, I received a letter from his secretary stating that there was a charge of $1 for the Admiral's autograph. I sent him a check, made out to Richard E. Byrd. He signed the stamp "R.E. Byrd," and I also had his signature on the back of my check, thereby getting two signatures for the price of one. Edward, Duke of Windsor, lived at the Waldorf-Astoria in New York City. I sent him a stamp issued in 1936, when he was still King Edward VIII (Great Britain Scott 231), which he very kindly autographed for me. Unfortunately, the postman folded the letter when putting it in my mailbox. After this, I marked all my reply envelopes, "Please do not fold." The only member of the Royal Family of the Netherlands who would send me an autograph was Bernhard, Prince of the Netherlands. He signed a stamp from Surinam showing the Royal Family (Scott 176). I wrote to the Shah of Iran while he was visiting the United States. The only stamp I could obtain at the time was Iran Scott 953. The stamp is blue, and something I had not planned for happened: the Shah signed his name in blue ink in Arabic. The signature, therefore, is not very noticeable, but it is there nonetheless. Prince Rainier III of Monaco has a beautiful clear signature, one that goes from one side of the card to the other. I managed to get his autograph when he was in New York, during his engagement to Grace Kelly. He signed across Monaco Scott 247. The Dominican Republic issued a set of stamps in 1957 celebrated the 16th Olympic Games, held in Melbourne, Australia, in 1956. Two featured famous American athletes: Jesse Owens (Scott 475) and Bob Mathias (Scott 478) - both of whom were willing to autograph their stamps for me. Lord Burghley of England was shown on Scott 477 of the same Olympic Games set. His return letter to me contained two signatures with a note of explanation stating that, with the recent death of his father, he had succeeded to the title of The Marquess of Exeter and thus no longer was permitted to use the signature "Burghley." He therefore put both signatures on my stamp. 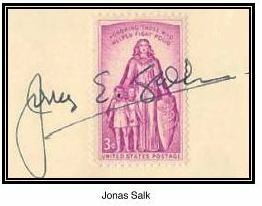 Dr. Jonas Salk, discoverer of the Salk vaccine, was not pictured on a stamp, so I used U.S. Scott 1087, honoring those who fought against polio and issued in 1957. The composer Jean Sibelius is shown on a stamp issued by his native Finland in 1945 (Scott 249). I wrote to him in 1953, but did not receive a reply, so I tried again in 1957. This time I was very fortunate in receiving his autograph, as he passed away, only two weeks after I received the autograph in the mail. Some of the signatures are those of people who have since fallen from power. One in my collection is that of Syngman Rhee, former President of the Republic of Korea. 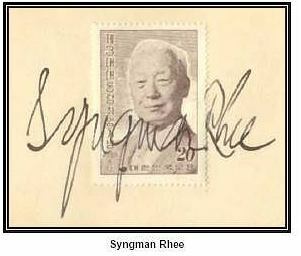 The signed stamp (Korea Scott 227) commemorates the third inauguration, in 1956, of the then 81-year-old Rhee. 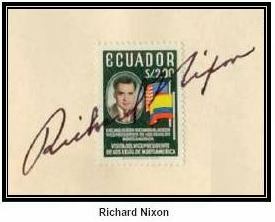 Richard Nixon, Vice President of the United States under the Eisenhower administration, is pictured on a stamp issued by Ecuador in 1958 (Scott 639). I obtained his signature through the efforts of a friend who had connections in Washington. I wrote a "To Whom It May Concern" letter, which I sent to my friend. He, in turn, forwarded it to his party, and back to me came the Nixon signature. President Dwight D. Eisenhower's autograph, signed exactly the way I wanted it, took some doing. First I sent him the 3-cent 1945 Army Issue (Scott 934) in November 1951, while he was Supreme Commander in Europe. I received a letter from his Aide stating that the General had sent me his autograph on a card but would not sign across the stamp as I had requested. I wrote to him again in August 1952 when he was running for election to the presidency. This time I sent him a stamp picturing the White House (Scott 990). I received an autographed picture. I tried a third time, in July 1957, while he was President. 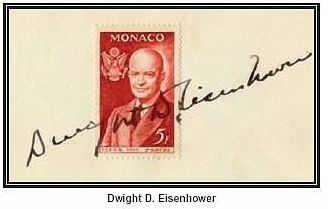 This stamp was from Monaco (Scott 357) and featured a portrait of Eisenhower. The signature was obtained in the same manner as was Nixon's. It's good to have friends who can help you out! Naturally, not knowing whether Eisenhower or Stevenson was going to be elected to the presidency in 1952, I wrote to them both, using the White House stamp mentioned above. 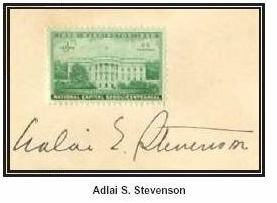 Stevenson signed his name beneath the stamp. I wrote to him again, asking him to sign across the stamp itself, which he very kindly did. He may well have figured that a possible vote is a possible vote. Grace Kelly, Princess of Monaco, also signed her name beneath the Monaco stamp with her portrait (Scott 395), instead of across the stamp. I wrote to her asking, if I was not being too presumptuous, if she would sign it again. She did so, correctly this time, on Scott 393 from the same set. The exiled monarch of Bulgaria, Simeon II, is pictured as a child on a 1944 stamp of that country (Scott 439). We happen to be alumni of the same school, Valley Forge Military Academy, and I wrote to him at the school in 1959. He not only signed the stamp, he also sent me an autographed picture of him in his cadet uniform. In September 1960, many people pictured on stamps were in New York attending the meetings of the United Nations. Among them was Marshal Tito of Yugoslavia. I sent him Yugoslavia Scott 389 celebrating his election to the presidency in 1953. 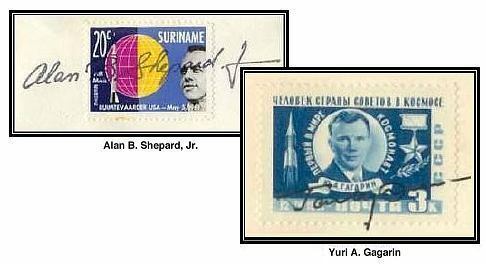 Surinam was the first country to have a stamp picturing the first American in space, Alan B. Shepard Jr. I wrote to him at Cape Canaveral, Florida, in July 1961, and received his autograph a few weeks later. His reply came from his home in Hampton, Virginia. Not knowing the exact address of Major Yuri A. Gagarin, I wrote to him in care of The Kremlin, U.S.S.R. The 1961 stamp picturing him was Russia Scott 2463. Hungary was very obliging and issued a set of space stamps to honor the world's first seven astronauts, among whom were pictured John Glenn (Scott C223), Scott Carpenter (C224), and Walter Schirra Jr. (Scott C227). I wrote to all three astronauts, care of NASA, Langley Field, Hampton, Virginia, on January 15, 1963. John Glenn was the first to answer on January 28, followed by Scott Carpenter on February 4, and finally, on May 2, the autograph of Walter Schirra Jr.
Francis Cardinal Spellman appeared on a stamp issued by Nicaragua (Scott C431). I wrote to him at St. Patrick's Cathedral in New York City on October 9, 1964, and within one week had his reply. Several South American countries issued stamps in honor of the visit of the President of Israel to their lands. I chose the stamp of Brazil (Scott 1021) and wrote to President Zalman Shazar on August 13, 1966. I received a reply on September 16, with the autograph, but unfortunately the signature was beneath the stamp. I immediately sent another request for a signature across the stamp itself, and on December 9, the stamp was returned with his signature correctly placed. On September 1, 1966, I sent letters to the Russian cosmonauts Lt. Colonel Alexei Leonov (pictured on Hungarian Scott C252), Lt. Colonel Pavel Popovich (pictured on Romania Scott C125), and Major Gherman Titov (pictured on Russia Scott 2510). All letters were sent to the Kremlin, Moscow, U.S.S.R. My first reply, on October 14, was from Titov, who sent an autographed postcard as well. Replies two and three came on the same day, December 3. Leonov also sent an autographed postcard, whereas Popovich just returned the signed stamp. Thank you for writing to the astronauts. However, astronauts McDivitt, Young, White and Grissom are deeply involved in preflight activities and their future availability to respond to such requests is an unknown factor at this time. Following the flight there will be extensive debriefing followed by postflight activities throughout the United States and possibly outside the continental limits of the United States. Due to the uncertainty of their availability in the immediate foreseeable future it is considered advisable to return these items to you as we do not want to risk the possibility of their misplacement. Perhaps at some future date, if still desirous in doing so, they could be resubmitted for possible autographing. The new president of Korea, Park Chung Hee, was kind enough to sign across the stamp I sent him (Korea Scott 579). He signed in Korean, unlike former President Syngman Rhee who signed his name in English. Former President Heinrich LüLŸbke of Germany created an unusual autograph by signing his first name on the left side of the stamp (Germany Scott 881)and his last name on the right side. President Lyndon B. Johnson's signature, like Eisenhower's, took some extra work to obtain. My first request brought a letter of apology from the President's assistant stating that Johnson could not sign the stamp and enclosing a printed signature card, plus a New Year's card with his printed signature and that of his wife, Lady Bird Johnson. I wrote another letter explaining that I used my collection for educational lectures and exhibits, and that none of the items were for sale. President Johnson made an exception in my case and signed across the stamp (Korea Scott 545). He also returned my reply envelope with his signature on that as well. Dr. Christian Barnard was pictured on a stamp from the Republic of South Africa (Scott 355), which he graciously signed. Major General Georgy Beregovoi, the Russian cosmonaut, signed below the stamp commemorating the flight of Soyuz 3 (Russia Scott 3545), but managed to tie the stamp to the card at the very bottom. President Nguyen Van Thieu, the president of Viet Nam, has a most unusual signature that looks just like a cancel. Definitely a standout autograph. I used a stamp marking his visit to Korea in 1969 (Korea Scott 656). The two Russian woman cosmonauts, Lt. Valentina Tereshkova and Lt. Col. Valeri F. Bykovaki, each signed the Bulgarian stamp honoring their 1963 space flight (Scott C100 and Scott C99, respectively). As I mentioned earlier, the Shah of Iran signed his name in blue ink on a blue stamp, and therefore the signature was not very clear. Due to this fact, I stayed away from blue stamps, and in so doing, I lost the only opportunity I had to obtain President John F. Kennedy's signature, for during his lifetime he was featured on only one issue, a blue stamp from Mexico. Not wanting to take any chances on missing out on Edward Kennedy's signature, I used a blue, unlisted air mail stamp from Ajman, and he signed it large and clear. Marc Chagall was never on a stamp, so I used a United Nations issue that pictured "The Kiss of Peace," one of the stained glass windows he had designed for the U.N. building in New York (Scott 180). The first time I wrote to him he signed under the stamp, so I wrote to him again, and the second time he signed along the bottom of the stamp tying it to the card. One signature that amuses everyone who sees it is signed by a dog. Herman Herst Jr. of Shrub Oak, New York, had a dog named Alfie who delivered the local mail, after it was cancelled with U.S. stamps at the post office. Alfie was pictured on a Local Dog Post private stamp, and accommodated me by placing his paw on a rubber stamp pad and giving me his pawprint across the stamp. Herman Herst Jr. also signed the stamp as a guarantee of authenticity. In September 1991 I noticed an article in Linn's Stamp News about the German submarine commander who had sunk the U.S. destroyer Reuben James during World War II. I wrote to Linn's and asked them to forward my letter to the author of the article so I could obtain the mailing address of Rear Admiral Erich Topp. I received the address a few days later, and wrote to Rear Admiral Topp, enclosing a German stamp from 1944 that shows an officer peering into a periscope (Scott B260). The image was taken from German newsreel footage of Commander Topp during a wartime patrol. I wrote to the Admiral in Spain and just a few weeks later my stamp was duly returned with his signature. During July 2000, I sent letters to various people and was successful in obtaining the signatures of President Gerald Ford (Liberia Scott 934), Mark Spitz (Liberia Scott 619), Bill Cosby (U.S. Scott 3190j), and Kim Young Sam, the former President of Korea (Korea Scott 1692). Over the years I have written to many people who either just have sent their autograph on a card or signed their name near the stamp, but not across it. President Herbert Hoover was not pictured on a stamp during his lifetime, but he was instrumental in establishing Arbor Day as a national holiday. I sent him the Arbor Day stamp (U.S. Scott 717) in 1954, but as he had a policy of not signing individual items all he would send me was a card bearing his signature. King Paul of Greece sent an autographed picture postcard in 1955, as did General Francisco Franco of Spain that same year. Paavo Nurmi, an Olympic great from Finland, signed next to the stamp in 1957. He is pictured on Dominican Republic Scott C97. King Hussein of Jordan sent a picture postcard in response to my 1960 request, along with an autographed card. Colonel Pavel Belyayev, the first man to float in space, is pictured on Hungary Scott C251. 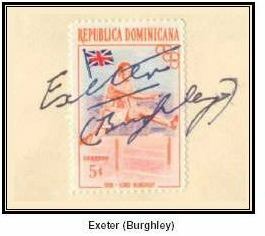 He signed his name to the right of the stamp in 1966. The signature of Haile Selassie appears under the stamp. He is pictured on many stamps from Ethiopia; I chose Scott C25, which shows the Emperor's portrait and Zoquala, an extinct volcano. I had written to Haile Selassie many times, and in 1966 finally managed to get his signature through the Minister of Finance of Ethiopia, with the help of a letter of introduction. Several years after I received the signed stamp, I was exhibiting my collection when a gentleman approached me to say that he had Haile Selassie's signature and it did not look anything like the one I had. On closer scrutiny, it turned out that Yilma Deresee, the Minister of Finance to whom I had sent the stamp for the Emperor to sign, had indeed signed his own name. The Emperor has since died, so this is one that I lost, but it makes for an interesting story. Dr. Albert Schweitzer is pictured on a stamp from Monaco (Scott 326). I wrote to him on October 10, 1964. More than two years passed, during which Dr. Schweitzer died. I had long since given up ever hearing anything from him or his hospital when, in November 1966, I received a letter from Mrs. Hanna Oberman, in which she enclosed a photographed autograph of Dr. Schweitzer. Other requests have been denied altogether because the person to whom I had written made it a policy to sign no autographs: Queen Juliana of the Netherlands, Queen Mother Elizabeth of England, ex-King Michael of Romania, and Winston Churchill. Others have not responded at all: Col. Charles Lindbergh, Gen. Chiang Kai-shek, and President Tubman of Liberia. No matter what the result, when I have some of my autograph request letters in the mail, I am always the first to the mailbox, waiting expectantly to see if my request has been granted. It is an even greater thrill to open an envelope and find the signed stamp. Sometimes I get an unexpected bonus: Following my October 1966 talk before the Long island Women's Stamp Club, I received a very nice thank you note from Secretary Helen Suran who neatly signed her name across U.S. Scott 1316 recognizing seventy-five years of service by the General Federation of Women's Clubs. A final stamp that I enjoy sharing is the 11/2-cent Martha Washington (U.S. Scott 805) with a signature across it. A friend made this up for me many years ago. When I lecture on the collection, with a slide presentation, and this slide comes up, I tell my audience that I had one devil of a time "digging this one up." It's amazing, but some people would actually ask me how I got the signature across the stamp, and then become terribly embarrassed when I explained that it was just a gag stamp. Now I tell everyone right out that the signature is a fake. Richard Novick has been collecting stamps since 1929 and picture postcards since 1969. He began selling stamps in 1946 after his return from the U.S. Air Corps, and became a full-time dealer in 1979.